Heat oven to 400° F. Place both pie crusts in 15x10x1-inch pan, overlapping slightly. Fit into pan, pressing into corners. Trim edges to about 1/2 inch overhanging sides of pan, then fold over and tuck into pan. In large bowl, toss Filling ingredients. Dump into crust. In small bowl, mix Topping ingredients with fork. Use fingers to form olive-sized chunks of topping. Scatter over top of filling. 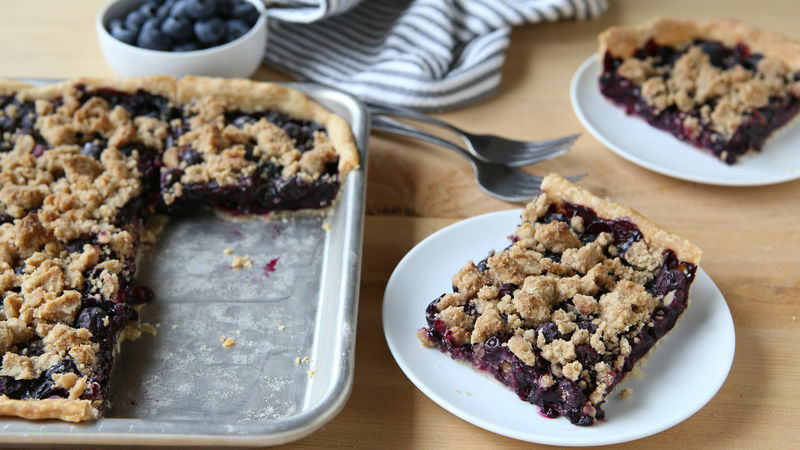 Bake 40 to 45 minutes or until topping is golden and blueberry filling is bubbling. Cool slightly. If desired, serve with vanilla ice cream or whipped cream.